A look back at how much we’ve raised and who we’ve donated to over the years. Total donations for year was £12,046. The remainder will be carried over to 2019. Total donations for year was £14,757. The remainder will be carried over to 2018. Total donations for year was £9,162. The remainder was carried over to 2017. Total Fundraising for 2015 was £18,341 – our best year yet! Total donations for year was £16,038. The remainder was carried over to 2016. Total Fundraising for 2014 was £! Total donations for year was £4,186. The remainder was carried over to 2015. Total Fundraising for 2013 was £! Total donations for year was £5131. The remainder was carried over to 2014. Total Fundraising for 2012 was £! Total donations for year was £6,599. The remainder was carried over to 2013. Total Fundraising for 2011 was £! Total donations for year was £5,143. The remainder was carried over to 2012. Total Fundraising for 2010 was £15,501.85! Total donations for year was £14,719.94. The remainder was carried over to 2011. Fund Raising for the year to 31st December 2009, totalled £10,763.52. Total donations for the year was £11,237.04. Fund Raising for the year to 31st December 2008, totalled £10,108.96. Total donations for the year was £10,086.60. Fund Raising for the year to 31st December 2007, totalled £9,870.95. Total donations for year was £10,524.55. The shortfall of £653.60 was covered by a donation from members Club funds. The annual AGM was held Tuesday, 9th January 2007. Fund Raising for the year to 31st December 2006, totalled £13,070.60. The annual AGM was held Wednesday, 4th January 2006. Fund Raising for the year to 31st December 2005, totalled £12,703.88. Total donations for year was £13,793.35. The shortfall of £1,089.47 was covered by a donation from members Club funds. The annual AGM was held Tuesday, 4th January 2005. Fund Raising for the year to 31st December 2004, totalled £10,960.51. Costs incurred, totalled £352.16 leaving a Net profit of £10,608.35. Total donations for year was £10,677.17. The shortfall of £68.82 was covered by a donation from members Club funds. The annual AGM was held Tuesday, 6th February, 2004. Fund Raising for the year to 31st January 2004, totalled £11,288.33. Costs incurred, totalled £1,620.96 leaving a Net profit of £9,667.37. Total donations for year was £9,870.34. The shortfall of £202.97 was covered by a donation from members Club funds. Fund Raising for the year to 31st January 2003, totalled £***. Costs incurred, totalled £**** leaving a Net profit of £***. Total donations for year was £9,419 The shortfall of £** was covered by a donation from members Club funds. Fund Raising for the year to 31st January 2002, totalled £***. Costs incurred, totalled £**** leaving a Net profit of £***. Total donations for year was £5,729 The shortfall of £** was covered by a donation from members Club funds. Fund Raising for the year to 31st January 2001, totalled £***. Costs incurred, totalled £**** leaving a Net profit of £***. Total donations for year was £3,083 The shortfall of £** was covered by a donation from members Club funds. Fund Raising for the year to 31st January 2000, totalled £***. Costs incurred, totalled £**** leaving a Net profit of £***. Total donations for year was £2,020 The shortfall of £** was covered by a donation from members Club funds. Fund Raising for the year to 31st January 1999, totalled £***. Costs incurred, totalled £**** leaving a Net profit of £***. Total donations for year was £1,715 The shortfall of £** was covered by a donation from members Club funds. Fund Raising for the year to 31st January 1998, totalled £***. Costs incurred, totalled £**** leaving a Net profit of £***. Total donations for year was £1,162 The shortfall of £** was covered by a donation from members Club funds. Fund Raising for the year to 31st January 1997, totalled £***. Costs incurred, totalled £**** leaving a Net profit of £***. Total donations for year was £700 The shortfall of £** was covered by a donation from members Club funds. Fund Raising for the year to 31st January 1996, totalled £***. Costs incurred, totalled £**** leaving a Net profit of £***. Total donations for year was £1,541 The shortfall of £** was covered by a donation from members Club funds. Fund Raising for the year to 31st January 1995, totalled £***. Costs incurred, totalled £**** leaving a Net profit of £***. Total donations for year was £398 The shortfall of £** was covered by a donation from members Club funds. 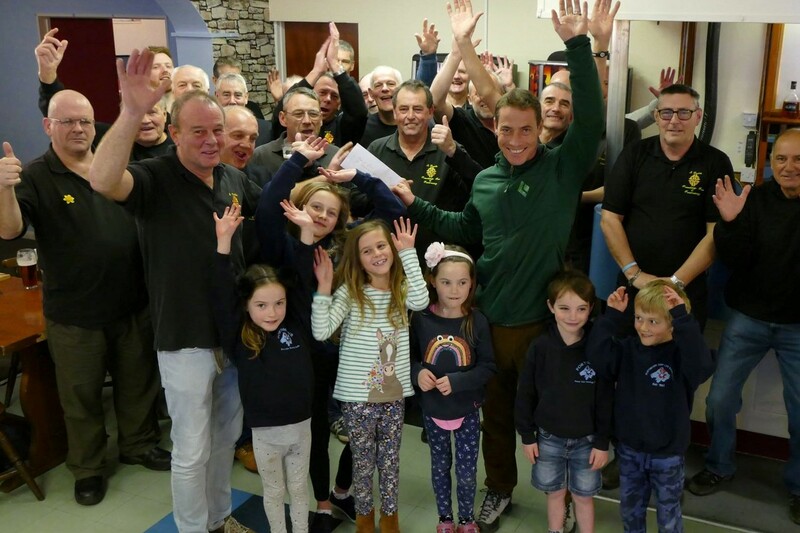 Founded in 1995 to raise money for local causes, The Penknife Club now raises between £5K - £15k each year for charities and local voluntary groups through putting on events for the community, such as the New Year's Day Swim.